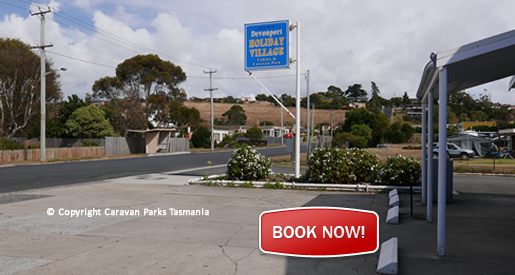 The Devonport Vacation Village is located just 3 minutes drive from Devonport Airport or the Spirit of Tasmania ferry. 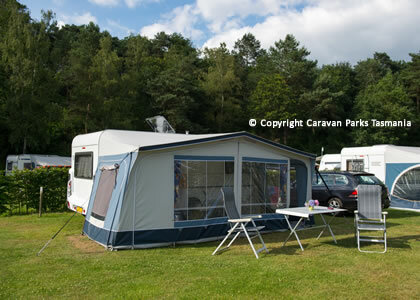 This caravan park offers tent camping, caravan sites and modern cabins. You will be located just minutes from the waterfront on a glorious coast, with its beaches, bays and rocky cliffs, and white, white sands for long romantic walks. Vacation Village Devonport is designed for your great holiday. There is a playground for the children, eight acres of gardens and trees, a car wash, supermarket, gas, a suite for honeymooners and barbecue areas for Australia's favourite mealtime. Devonport restaurants are just a few minutes drive away. 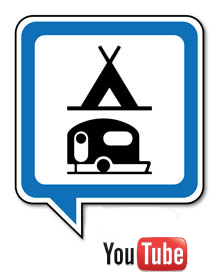 The Devonport Vacation Village East Devonport is located app. 1 kilometre from the Spirit of Tasmania ferry terminal; Devonport is app. 60-75 minutes drive from Launceston. Devonport is a coastal tourism, fishing city on the north-west of Tasmania, Australia located at the mouth of the Mersey River. Devonport and the smaller city of Burnie which is further North-West are the major regional centres of the north-west of Tasmania. For visitors to Tasmania, it is primarily known as the port for the Spirit of Tasmania ferrys that travel between Tasmania and Melboune Victoria.